Improving the billing experience for an essential government service – Let's design a better future, together. SA Water’s bills were delivered quarterly by mail. Any customer with questions were directed to the SA Water contact centre that operated Monday-Friday during business hours. While contact centre service was rated very highly there was a increasing number of customer complaints calling for digital services which would allow access 24/7. In addition, the cost to the business to resource the contact centre and respond to increasing call volumes was growing. SA Water needed a solution that offered more choice to customers and increased operational efficiency at the same time. Funding needed to be approved by the economic regulator (ESCOSA) as part of our Digital Strategy Program submission. Prior approval included the Water Minister and SA Water leadership team. As author of the Digital Strategy I led business scope definition, requirements and cost-benefit analysis with the finance team and also acted as business lead during procurement of our contractor. Mapping existing insights and customer complaints (I used affinity mapping to cluster and collate key themes and distil them into actionable insights for the team). Commissioning an external research agency to run a series of customer workshops (I provided a list of hypothesis/ assumptions to test as well as guides for these sessions and was an active participant). User testing as prototypes were designed (I developed research guides for this work, scripts and scenarios and trained the team on how to do these). Outcomes from this research included design principles, prioritised user needs and value propositions and confirmation of adoption drivers. This research also identified residential customers as our priority segment. 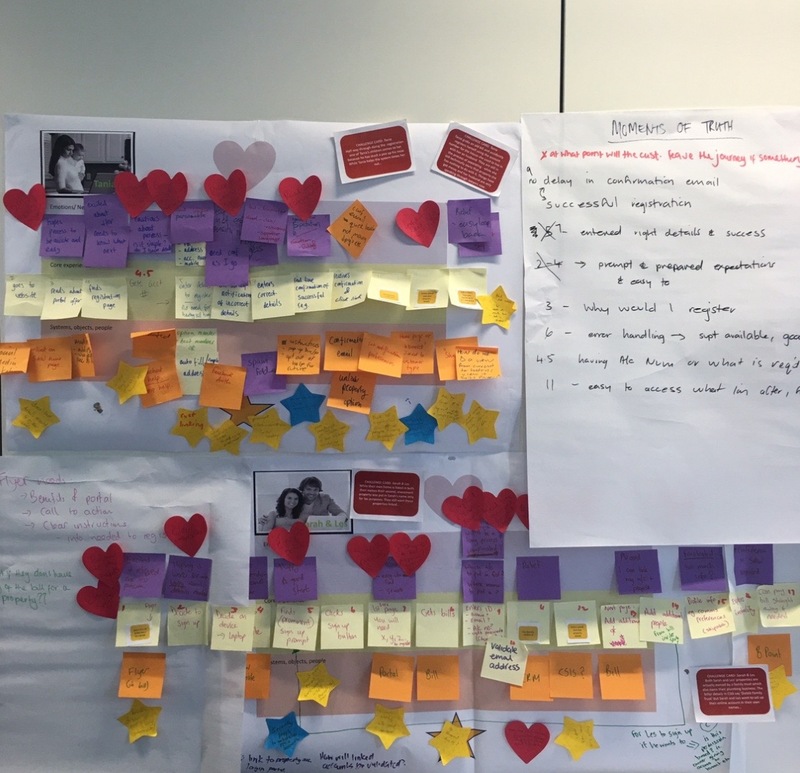 I ran a series of journey mapping workshops with the internal, cross-functional team (technology, customer service and frontline staff) based on existing digital personas (developed as part of the Digital Strategy) and new user stories. These workshops had the additional goal of building internal capability amongst the digital team to apply human centered design to solve problems. Our contractor was responsible for UX and UI design and prototyping once we entered build phase. Prior to that I undertook low fidelity prototyping with the digital team using role playing and scenario walk through to understand users key decision points and needs. 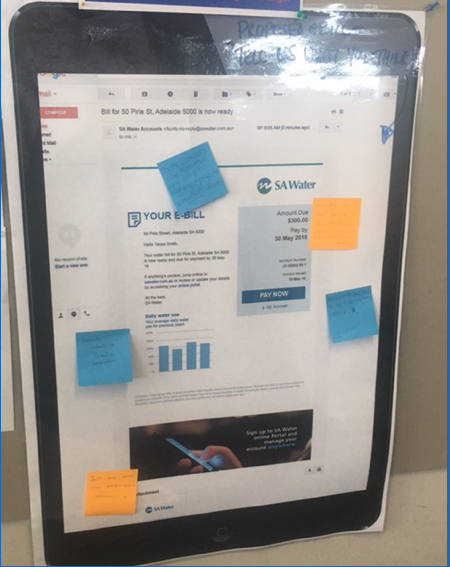 I also used paper prototypes of eBills blows up to poster size to gain feedback from internal staff – especially the customer service team. 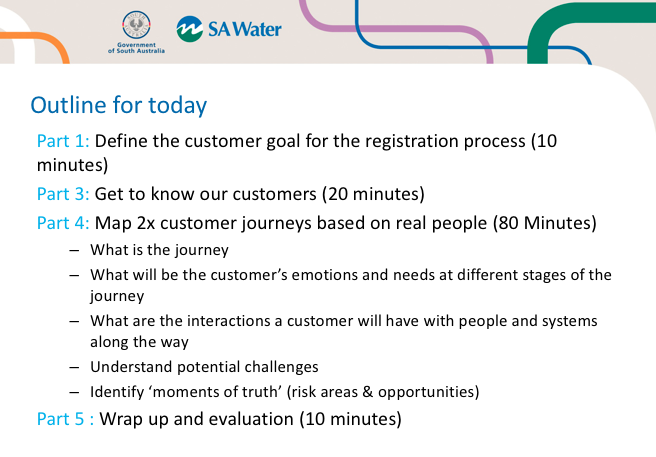 This was one of the first human centered design processes SA Water had undertaken. It wasn’t perfect but I knew it was a significant opportunity to engage staff across the business and build capacity so that they could use design thinking approaches to solve problems in the future. One of the most successful things we did was to move the project team into a room right by the contact centre’s kitchen. We always left the doors open and invited them in to see what we were doing. 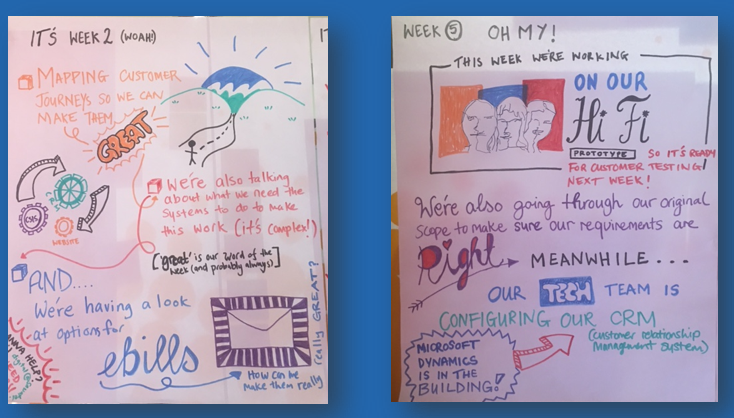 Every week I put up a new hand drawn poster that detailed what we had been working on visually – it was unpolished but gained cut-through and started conversations because it was so different from other corporate communications. Staff were also invited to participate in research and design activities as we did them. This had a huge benefit when we returned later train staff on how to support customers using the portal for the first time. It resulted in a significant shift in thinking and greater empathy for end-users as well as a more collaborative approach to solving customer problems across internal teams. SA Water’s Customer Account Portal, mySAWater , was launched after I had left SA Water and so I don’t have data on it’s performance. 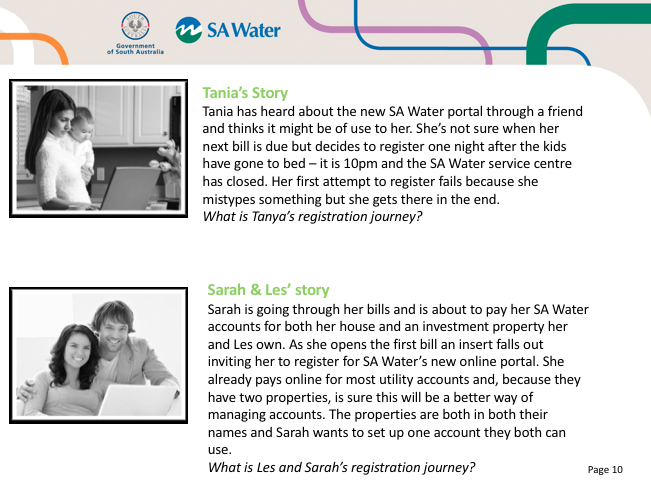 I do know that it has changed the way SA Water delivers it’s billing services. The early design work I did enabled the project delivery team to hit the ground running with a clear understanding of customer needs and with the support of the leadership team and South Australian Government to deliver the new service. The most significant shift though was cultural. This project succeeded in demonstrating the benefits of human centered design and getting people excited about its potential at SA Water. It started transformation process which now sees human centered design as a core part of service delivery.